Photo: These children enjoy singing together during a break from their studies at our Children’s Hope Center school in Kampala, Uganda. 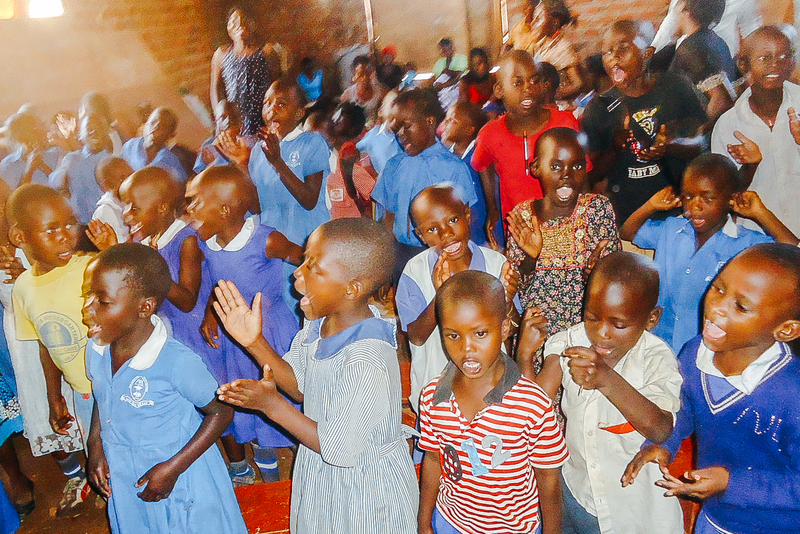 We are happy to report that our Children’s Hope Center school in Kampala started a new semester on September 19th. Our slum outreach program is operated by locally empowered leadership in Uganda. In its current humble facility the center offers a Kindergarten through 7th primary education for 127 children (ages 3-15) who would otherwise have no access to an education. The children are studying a complete curriculum with subjects such as English, physical education, mathematics, science, reading, social studies, and social studies taught by qualified, salaried teachers. Unusually heavy rains which occurred from April-July caused severe flooding. The destructive weather affected our Children’s Hope Center since it is located in a colony situated at the bottom of sloped terrain near the shores of Lake Victoria. Thus, sadly, much of the sewage and rainwater drainage of neighborhoods in higher elevations collected in stagnant pools causing flooding problems during the rainy season. The recent floodings washed the soil away, flooded and destroyed our pit latrine toilet, rotted our school desks and washed some of them away, ruined many of our textbooks and other school supplies, and weakened our floors. The floods harmed our facilities and hindered our normal operations to the point that we had to delay opening the school at our Children’s Hope Center, and temporarily moved the school to nearby Kabalagala. Photo inset: (Top-left): Some of the local children enrolled in our Kampala Hope Center program pray before their lunchtime meal. 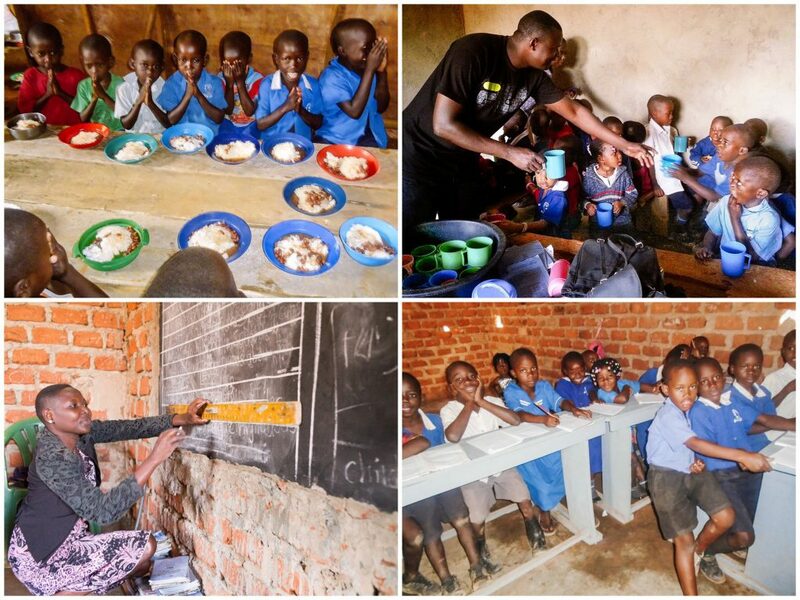 (Top-right): A native staff member of our Kampala team assists children at the center with breakfast. (Bottom-left): A teacher at our Kampala Hope Center prepares the chalkboard for her class. (Bottom-right): These students enrolled at our Children’s Hope Center are thankful for the opportunity to have an education they would otherwise have no access to. But now the heavy rains have subsided and we are thankful to be back in the Kampala Hope Center facility where the children are happy to be pursuing a quality education. Recently, we were able to make some improvements such as repairing the toilet facilities as well as phase one of repairing the floors with trucks of soil. With your support we hope to complete the second phase of repairs which include adding cement to the floors, plastering the walls of the main hall, and purchasing 60 new desks to replace our old desks that were destroyed by the flood waters. We are also seeking to purchase 6 large tables which will serve the dual purpose of aiding the younger children’s studies, and providing space for all of the children to eat their meals during breakfast and lunch. Our long-term goal and the ideal solution to the challenges our Kampala team faces is to relocate permanently. The ongoing flooding creates repetitive problems, especially for the foundations of our buildings — they continue to be weakened by high levels of water, threatening to collapse the buildings at any time. Thus, we need to relocate to an area that will not be severely affected by heavy rains. With your support we hope to purchase a plot of land where we can construct a strong structure for a new school with many classrooms, cultivate a garden, and build an orphan home, a medical clinic, the caretaker’s quarters, a kitchen, and a guest house. We are looking for 5 acres (or more) of land outside of Kampala where the prices are more affordable than in the city. This new location would be a great answer to prayer, and would ensure the safety and comfort of our children.